A few weeks ago David Chilcott pinged me about a telesummit called Conscious Software Development that is being hosted by Michael Smith starting Nov 10. Since my book has that name he thought that there might be some connection. Thanks David! And sure enough there is. Last Friday, I had my interview with Michael. It was fun. In particular, I got to explore in more depth what my book is about and why it might be important. With the huge amount of information available on how to do things what am I adding? An early reviewer was not too pleased that the book was not a ‘how to’ book. To answer Michael’s questions, I found myself referring to the work of Ken Wilber, the renowned philosopher. Ken’s Integral Theory has influenced me for many years and it has been interesting to see the growing uptake of his ideas. Michael Spayd is using these ideas in his upcoming book on Agile Enterprise Transformation. A fundamental concept is the four quadrants. The axis are Individual/Collection and Interior/Exterior. Most change agents operate in the ITS or Systems space. We see more and more folks pointing to the WE or Culture space as important. Many coaches focus on IT or Behavior space. Not many focus on the I or Personal Space. That is where Conscious Software Development primarily sits. 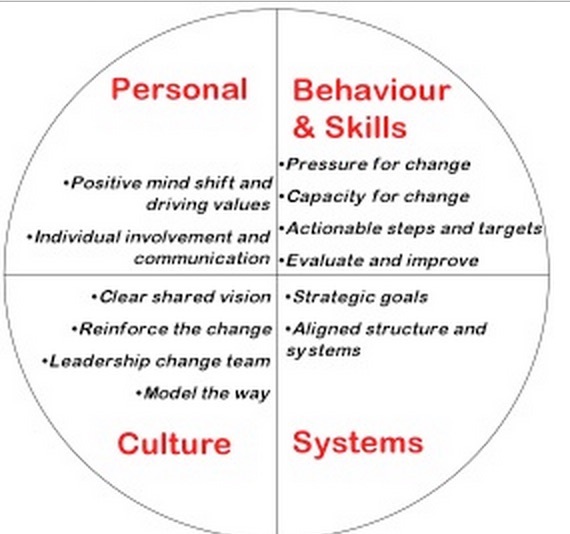 Of course, all the quadrants must be addressed for lasting change to occur. 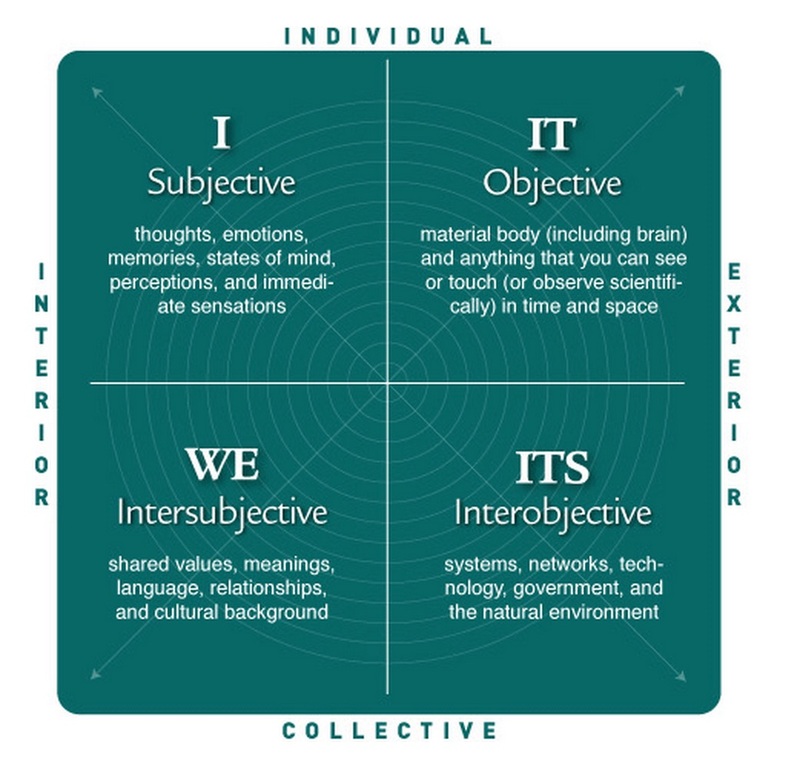 And I find myself personally interested in exploring the I space in work environments. So, thanks Michael for an interesting conversation! Go check out the telesummit at http://conscioussoftwaredevelopment.com/. The speakers cover a wide range of topics. You may want to see if you can see which quadrant they are focussing on. 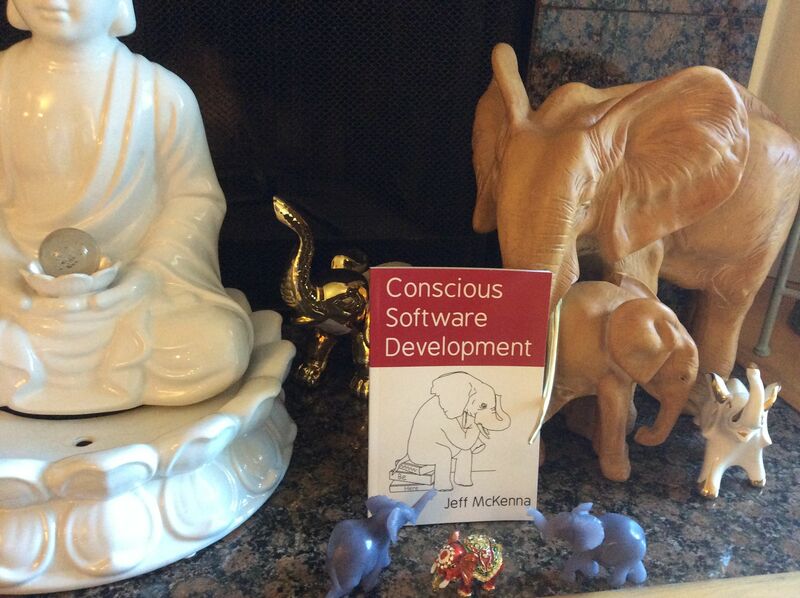 Conscious Software Development – DONE! At long last! My book is completed, done, finished, published, even reviewed. Here, you can see it above with two influencers: a few of my elephants and one of our Buddhas. You can find it on Amazon at http://bit.ly/JeffMcKennaBook. it is available in paper or on your Kindle. But this blog is not to explore the content of the book. That you can do by getting one! Here I would like to explore the process that produced it. As many have discovered before me, it took longer that I thought. My experience is what is often reported my new authors. Difficulties and setbacks. I had my share. The entire process took over three years with excitement, slogging, and heartbreak. The first big breakthrough was the process we used for the bulk of the writing. I did not write. Instead, we taped some 18 eight to twelve minute videos. Each was me talking about a topic. Very little prep for me (Anyone who knows me knows that I can ramble on at length on these topics!) and a simple setup. So I had the pleasure of writing a book with very little writing. Very exciting. There then followed some time of confusion and some painful adjustments. As we negotiated these difficulties, some clarity emerged on what the book should be. There were some fits and starts on the illustrations and a settling after we found Diana, And in the final times, we got it done. Thanks bunches, Steve. All in all, a journey I would not have missed. Last week when I still was in Kiev I had an opportunity to visit Kromtech. Kromtech is most well known for the MacKeeper product. 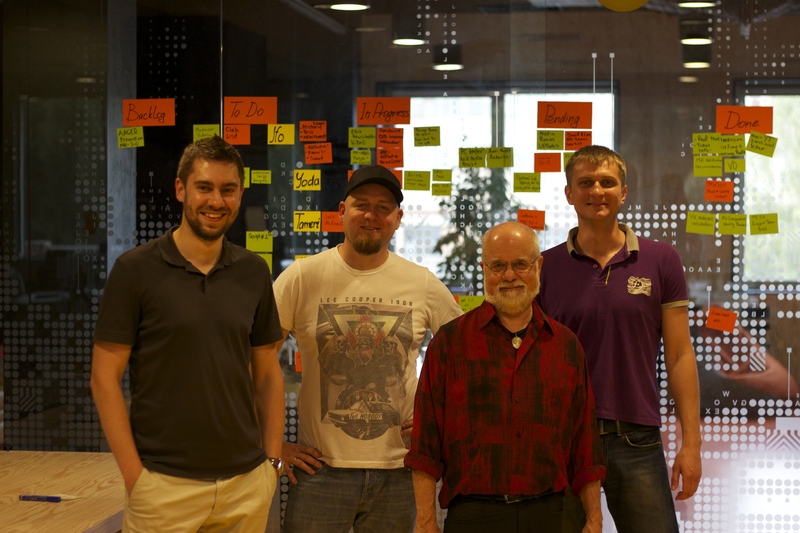 The CEO of Kromtech, Alexander Kernishniuk, attended on of my CSM trainings in Kiev some years ago. And he invited me to visit their new facilities in Kiev. Andreii Pavlenko of ScrumMaster.ua, my host while I am in Kiev, and I drove out to the Kromtech office and after some wandering finally found the office with the help of another employee of Kromtech, Nikita Rusakov. He helped us in and find Alexander. And surprise, Nikita was the photographer of record to make the photos that you see here. 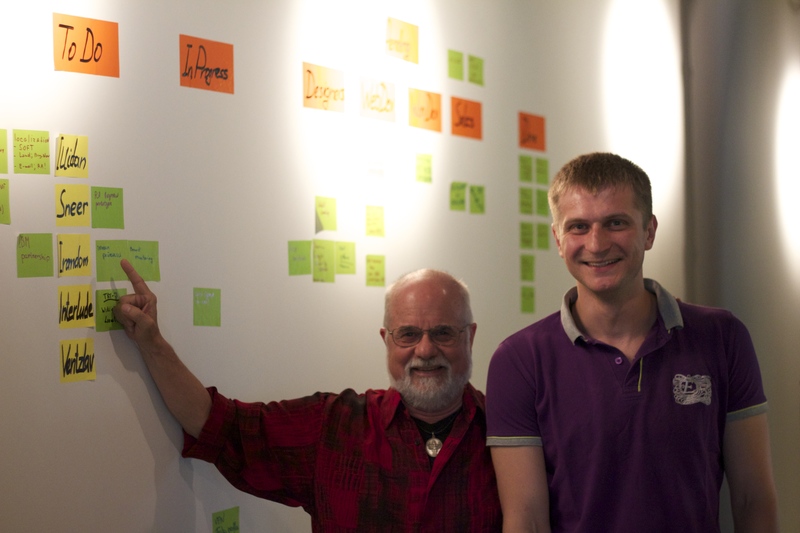 With Alexander was Jeremiah Fowler, the Communications Director, and Eugene Kovalev, the Chief Scrum Master. Eugene then directed us on a tour. First, lost in new construction and the Kiev tendency to have very obscure addresses. Ah, found by Nikita outside. Second, enter building obviously under construction, passed security and entered. Lots of graffiti on the walls. What am I getting into? Third, opening elevator on second floor reveals not much. Then we turn a corner and WOW! Very modern space, feeling a lot like Plug and Play in Sunnyvale. People at computers, bean bag chairs in meeting rooms, glass walls with sticky notes all around. Alexander clearly took the training to heart! Here you can see Alexander, Jerimiah, myself and Eugene in front of a wall (door actually!) and a sprint backlog. 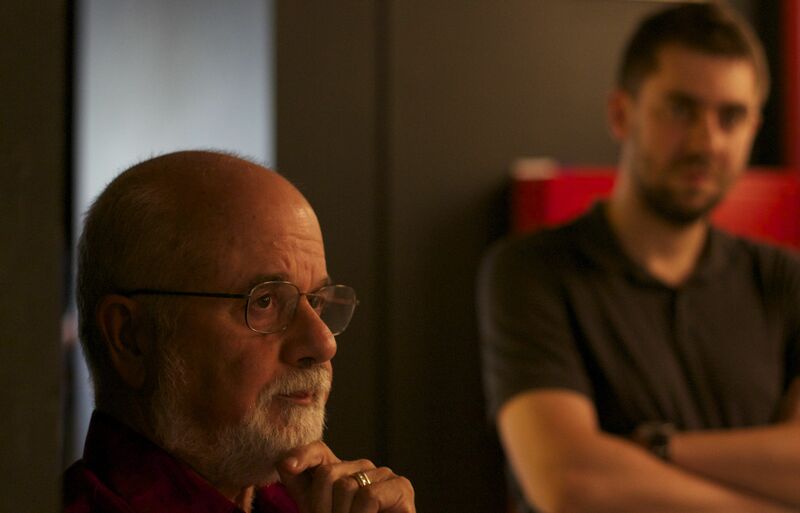 As we toured, Eugene described what we were seeing and we discussed how it was working. The usual supporting facilities were there: restrooms, meeting rooms, food space and some play space. But what really struck me were the team rooms. The glass itself was not plain but had some kind of designs etched in. Some walls had notes, diagrams and such in place using special pens that worked well on the glass. The feel was very open and yet when in an office with the doors closed, it was clear that you were in your team space. Each room could easily hold eight team members. As we looked around, Eugene (with Alexander barely able to hold himself back) and explored how well Scrum was working and how the facilities supported that work. As in every organization that I have known, each team was working differently in detail. Some were doing better than others and there was obviously room for improvement. 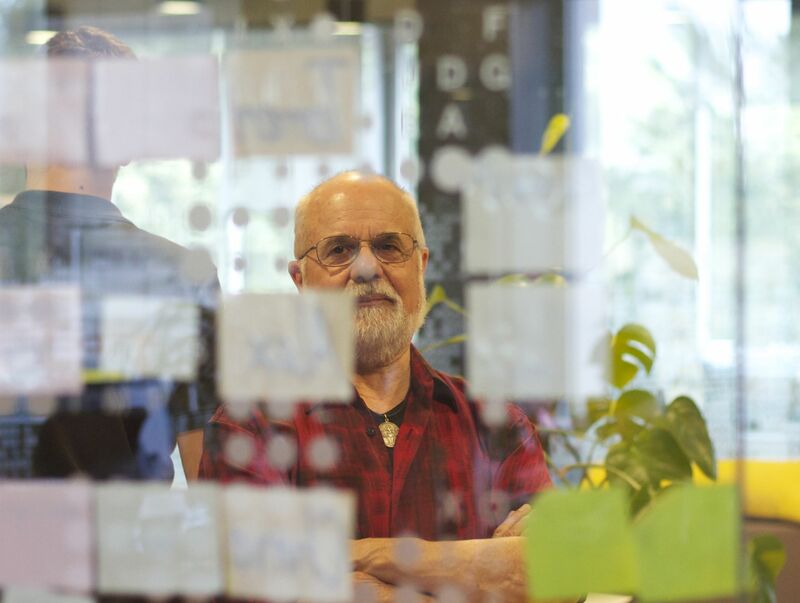 While the support of the CEO, Alexander was clear, the work of Eugene, acting as a Scrum Coach, was instrumental in the state of agile at Kromtech. He has guided the teams to a true agile environment using Scrum, XP and Kanban tool and techniques as needed. Here is Eugene and I (very staged I know!) pointing to the task board for a new team. The team was an ad hoc team that is looking a bit into future and catching cracks that are in the product planing, facilities changes, and anything else that seems to be getting dropped in the drum beat of normal backlogs and sprints. They were acting as a scrum team as far as managing their work. I love the idea of such a team in a organization the size here (about 200). Someone who is keeping an eye out, filling in holes, being an emergency resource. They are an embodiment of slack – needed in all organizations. One last note. The sticky notes on the walls were using some technology I have started to see in the last couple of years. In Kiev, they are called Stattys Notes. They use some kind of electrostatic mechanism to just stick to the wall, either the glass wall or as you can see above, a painted wall. The move easily and do not seem to fall off. Great tool to use. They can be ordered from Germany. After the facilities visit, Kromtech hosted Andreii and myself to some dinner at a local pizzeria. We drank a little beer, ate and swapped stories over a wide range of topics. Even some about Agile and Scrum. Well here we are in Kiev. I am back to my blog. I have not written for a long time. My PR people say it is time since my book is very, very close. I have been doing a lot of teaching and coaching. My students (how strange of me to consider them MY students!) are often asking me to publish. Finally it is time. I would say 6 weeks as of this date. Right now I am in Kiev for my annual visit. Ukraine has been very, very interesting this time. As you can imagine, a lot of folks, my mother especially, wondered if going to Ukraine now was a good idea. I was assured by my friends that live here that things were ok for me to visit. And they were right. I am starting my second week and it has been a very good trip. Today I took a long walk: down through Independence Square and then to Maidan Square in Kiev. The site of people taking a stand. During the last week most everyone I have talked to tells me going to Maiden during the cold of winter (-20 degrees some say) to help and add their support – food, coffee, money, blankets. And right NOW, every day, people are contributing money to support the army and continuing the movement. Supporting with supplies, money and love to continue what was started. Every day I hear dreaming and hoping and intense desire for living a life full of opportunities – without limitations of the past. Over the last week I have been educated with the history, the long history, and the current situation. As I walked the streets today and felt the people that were there, the history, the past, and now, the right now, merged into a flow of humans being and humans living. The human condition of dreams and living and loving and being. Rain came. I sat and drank a beer. And watched people mourning the lost people (people of all types – young old, male and female, all occupations) and absorbing the huge-ness and the normal-ness of it all. Celebration and sorrow – all present. As I moved away from the squares, I found an overlook over Kiev and the river. There were families, and lovers and old men drinking beer and arguing. Just a few blocks away the memory of serious conflict and striving. I saw the past with its golden domes and the present with the traffic and congestion, and the future with movement and grace. All present. All now. In some way I am adding my heart to this movement to the future.